What is the SLN Function (Straight Line)? 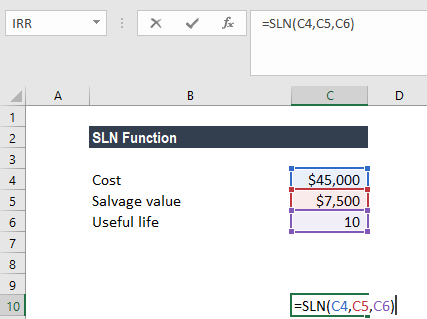 The SLN function will calculate the depreciation of an asset on a straight-line basis for one period. In financial modelingFinancial ModelingFree financial modeling resources and guides to learn the most important concepts at your own pace. These articles will teach you financial modeling best practices with hundreds of examples, templates, guides, articles, and more. Learn what financial modeling is, how to build a model, Excel skills, tips and tricks, the SLN function helps calculate the straight line depreciationStraight Line DepreciationStraight line depreciation is the most commonly used and easiest method for allocating depreciation of an asset. With the straight line method, the annual depreciation expense equals the cost of the asset minus the salvage value, divided by the useful life (# of years). This guide has examples, formulas, explanations of a fixed asset when building a budget. Learn more about various types of depreciation methodsDepreciation MethodsThe most common types of depreciation methods include straight-line, double declining balance, units of production, and sum of years digits. There are various formulas for calculating depreciation of an asset. Cost (required argument) – It is the initial cost of the asset. Salvage (required argument) – It is the value at the end of the depreciation (sometimes called the salvage value of the asset). Life (required argument) – It is the number of periods over which the asset is depreciated (sometimes called the useful life of the asset). Straight-line depreciation is the simplest way of calculating the depreciation of a fixed asset. Cost is the initial cost of the asset (at the start of period 1). Salvage is the final value of the asset at the end of its lifetime. The straight-line depreciation method subtracts a fixed amount from the value of an asset during each period of the asset’s lifetime. 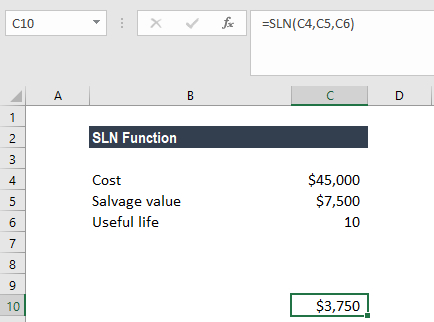 How to use the SLN Depreciation Function in Excel? $3,750 would be the depreciation to charged yearly for the given asset. If the asset was purchased in the middle of the year after the start of the financial year, the depreciation would be charged on a pro-rated basis. #DIV/0! error – Occurs if the given life argument is equal to zero. #VALUE! error – Occurs if any of the given argument is non-numeric.